She set her battered suitcase on the bed and began putting things in it: a dress and then another dress, a pair of shoes, stockings, a hairbrush. “How long are you going to be gone?” Freda asked. “You’d hate it. Funerals are terrible. Her mother left and, while Freda waited for Squeak to arrive, she sat in the middle of the couch facing the TV and had her dinner, which was a cold hot dog right out of the refrigerator, a piece of pimiento cheese, a couple of dill pickles and a piece of lemon pie, not baked but out of a box from the grocery store. One show ended and another began. When she looked at the clock and saw it was after seven-thirty, she hoped that Squeak had decided not to come and she would be staying by herself after all, in which case it would Squeak’s fault and not her own. Squeak finally showed up, though, with an overnight bag in one hand and her school books in the other. Squeak was a big girl with a broad face and a high forehead. Her pale skin and very fair hair gave her the appearance of having no eyebrows. She was one of the less popular girls in school, although she tried hard. “Have you had your dinner?” Squeak asked. She handed Freda the eyebrow pencil, turned all the lights on in the room and lay down on the couch. After she adjusted her hips and crossed her ankles, she snapped her fingers to let Freda know she was ready. Freda studied the picture, eyebrow pencil poised in hand. “I’m going to make you look so glamorous!” she said. She leaned heavily on the eyebrow pencil, almost breaking it a couple of times. After she drew the first eyebrow on with some difficulty, the second one was easier. “There!” she said with satisfaction. “How do I look?” Squeak asked. “I like prison matrons,” Freda said. They went into the kitchen. Freda sat at the table while Squeak looked in the refrigerator. She took out the pickles, cheese and butter. “How about a grilled cheese sandwich?” she asked. “I’d like one,” Freda said. “That’s not very nice,” Squeak said. Squeak put the pickles on the table. Freda took off the lid and stuck her fingers in the cold green liquid. “You got a boyfriend?” Freda asked. The skillet heated while she slathered butter on the bread. “I don’t want a husband,” Freda said. “You’ll change your mind when the right one comes along,” Squeak said. After they were finished eating and Squeak had stacked the dishes in the sink to wash later, they went into the living room and sat side-by-side on the couch. 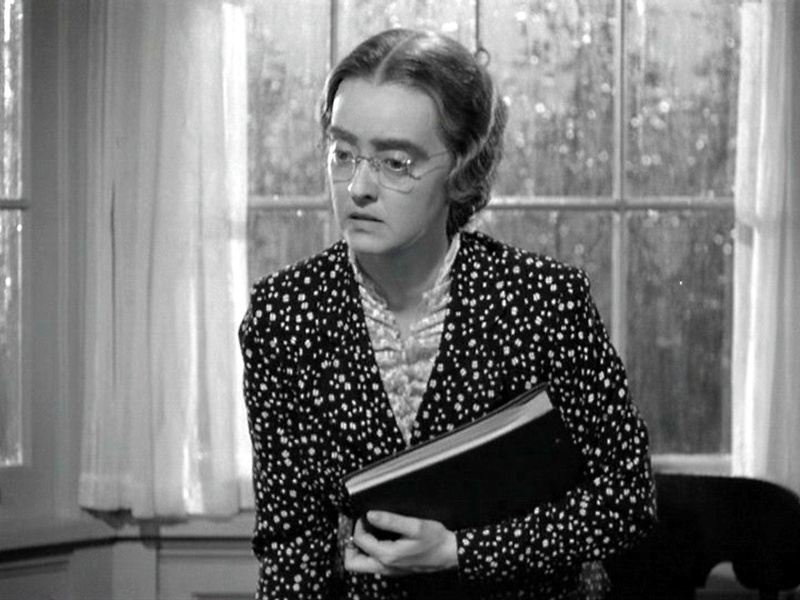 The movie Now, Voyager was just starting. A homely Boston heiress named Charlotte Vale wears orthopedic shoes and matronly dresses. She doesn’t wear any makeup and her eyebrows meet in the middle like an immigrant longshoreman. She stays in her room all the time, smoking cigarettes and carving ivory boxes, because her elderly mother is cranky with her and obviously doesn’t like her very much. When a sympathetic sister-in-law arranges for Charlotte to meet a pipe-smoking psychiatrist, he sees right away that she isn’t right in the head. Her mother, of course, believes there is nothing wrong with her and she is only putting on an act to try to get attention. Charlotte has a nervous breakdown (who wouldn’t?) and spends several months in the clubby, resort-type mental institution that the pipe-smoking psychiatrist runs in the country. When he says that Charlotte is once again ready to mingle in society, she goes, by herself, on a luxurious cruise to South America—not, however, before undergoing a physical transformation that can only be found in the movies: she loses thirty pounds, plucks her eyebrows, throws away the unattractive glasses she wears, starts using makeup, and develops a taste for high-fashion clothes. How could we have known there was a beautiful swan waiting to emerge from the ugly duckling? On the boat, the newly beautiful Charlotte Vale meets a man (what else?) to whom she is irresistibly drawn. His name is Jerry and he is strangely attentive to her in a way that no man has ever been. (“Nobody ever called me dahling before,” she says.) They spend a lot of time together seeing the sights in South America. When there is a problem with their car, they spend a night together in a shed, doing something called bundling, which, Charlotte says, is an old New England custom. Charlotte learns from someone who knows Jerry that his life hasn’t been especially happy, either. He has a clinging, possessive wife who won’t give him a divorce. He also has a crazy daughter named Tina who is like a younger version of Charlotte, unwanted by her mother in much the same way that Charlotte was unwanted by hers. The boat lands back in Boston and Charlotte says goodbye to Jerry, believing she will never see him again. All Charlotte’s friends and family, including the servants, are surprised at the extent to which she has changed. Everybody thinks she looks better, of course, except her mother, who has nothing good to say to her. She is offended by Charlotte’s new spirit of independence and threatens to take away all her money. Charlotte becomes engaged to a Boston blueblood like herself, but she doesn’t love him and can’t forget about Jerry. She wants to break off her engagement, and it is while she and her mother are arguing on this very subject that her mother dies of a stroke. Charlotte, of course, blames herself for her mother dying that way, right in the middle of an argument. Just as she is about to descend once again into madness, Jerry reappears, as much in love with her as he was on the cruise. In the end, Charlotte has her mother’s money and the enormous Boston house to herself. We know she could probably go crazy again at any time, but she is, for the moment anyway, oddly contented. She has Jerry with her and also Tina, Jerry’s crazy daughter. In the final scene, Charlotte and Jerry are standing at an open window in the library. Jerry lights two cigarettes at once in his mouth and hands one of them to Charlotte, in that odd way of his. “Do you think we can ever expect to be happy?” Jerry asks. The Max Steiner music swells and the camera pans upward to the summer sky, which has about as many stars in it as one might expect. “I thought the whole thing was silly,” Freda said. A loud knock at the door just then made Squeak scream. “Open the door!” a voice said. Without hesitation, Squeak swung the door open, and Stinky, her friend from high school, came inside. Behind Stinky was her boyfriend Ellison. “What are you doing here?” Squeak asked. Ellison made himself at home, sitting on the couch and putting his feet on the coffee table. “Got anything to eat?” he said. “I can put myself to bed,” Freda said. “I think you’d bother better leave,” Squeak said. Ellison had white-blond hair and a porkpie hat seated on the back of his head. He told people he was a jazz musician but he couldn’t play a note on any instrument. He was over twenty and always chose his girlfriends from the high school crowd. He and Stinky had been going around together for about a year. If Squeak was in the middle of the social hierarchy in high school, Stinky was all the way at the bottom. She lived with her mother and retarded sister in a residential hotel. She belonged to a girl gang, smoked cigarettes and drank hooch. The worst, though, was that she had been arrested for shoplifting costume jewelry and cosmetics. “My mother wouldn’t like it if you had a party with her not here,” Freda said. “Where is she?” Ellison asked. “Uh-oh!” Ellison said. He put his hand over his mouth. “What’s the matter?” Freda asked. “Come and give your lovin’ daddy a great big old kiss,” Ellison said to Stinky, holding out his arms to her like a mammy singer. “Always ready to accommodate my man!” she said. She sat on the couch next to him and soon they were entwined in a passionate embrace. “Go to bed, Freda!” Squeak said. Stinky and Ellison were smacking their lips together and moaning. Stinky was pulling at Ellison’s back, trying to get him on top of her. “I never saw anything like this before,” Freda said. “I think they need to cool off, don’t you?” Squeak said. She went into the kitchen and filled the dishpan with cold water and carried it into the front room and poured it over Stinky and Ellison. “I don’t know,” Freda said. Freda ran into her room and closed the door, jumped into bed with her clothes on and pulled the covers over her head. She would have to wait until Sunday night to find out if her mother had burned to death. It was going to be an awfully long weekend.